The lecturers are really, really good. They give us a lot of information and you can also access everything you are taught online. We have cases, lecture notes, handouts, PowerPoint presentations – everything. They make everything so helpful for us. How did you find out about your course at NTU? It was through an agent in Nigeria – Kaplan. My Dad was at home and got the flyer, so he called them and talked to them, they told him about the opportunities for me. They helped me with almost everything. They helped me to get the results I need in high school, the visa, accommodation, getting a UK bank account, basically they helped me with everything. Everything was just made so easy for me. 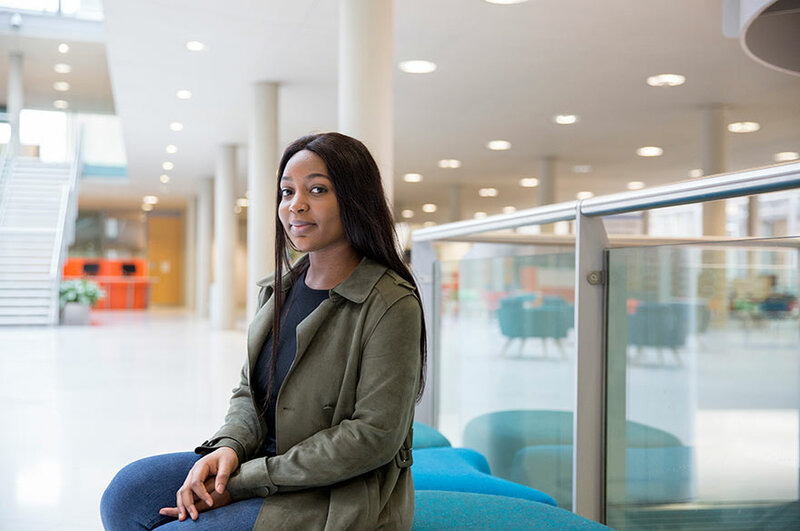 Tell us about your experience at Nottingham Trent International College (NTIC). My first day at NTIC was really, really good because I met so many people from Nigeria which was so helpful for me to feel at home on the first day. We had time to explore and get familiar with the British education system as well. Everyone that I knew passed the exam. I made friends from lots of different places like Saudi Arabia, India and from China as well. In our class everyone was friends with everyone. I really enjoyed my NTIC experience and was really sad leaving. When I came to the UK I was actually 17 so they gave me a lot of support. Every week I would go and speak to someone about how I was feeling about my time here – I really felt like they were taking care of me because I was underage, and even when I turned 18 they still contacted me to make sure I was OK.
What is the best bit about your course? The lecturers are really, really good. They give us a lot of information and you can also access everything you are taught online. We have cases, lecture notes, handouts, PowerPoint presentations – everything. They make everything so helpful for us. They encourage us to ask questions and they give us a lot of feedback and guidance which I think is so useful. I have just applied to complete my Masters at NTU. I’m going to do my Masters in Human Rights Law and after that I will go back home to Nigeria and go to Law School. What made you decide to do your Masters here as well? I am already familiar with the university and I am already here so that makes it easier. Also the University offers a 25% discount if you have already studied here and I cannot get this opportunity anywhere else. I am already familiar with the classes, the lecturers, the buildings and I noticed that it is going to be the same tutors and lecturers teaching us for the Masters that taught me in my undergraduate degree which is really great. What do you think are the best things about Nottingham for an international student? I would definitely say the food. There are so many restaurants everywhere. You get to try out all types of food like Chinese food, Indian food, - I love Indian food! I think for me, Nottingham is mostly for students. It’s so convenient for students, I live in the city centre and everything is available to me which is really great.